Emeralds are easily identified by, their stunning emerald green colored feathers. 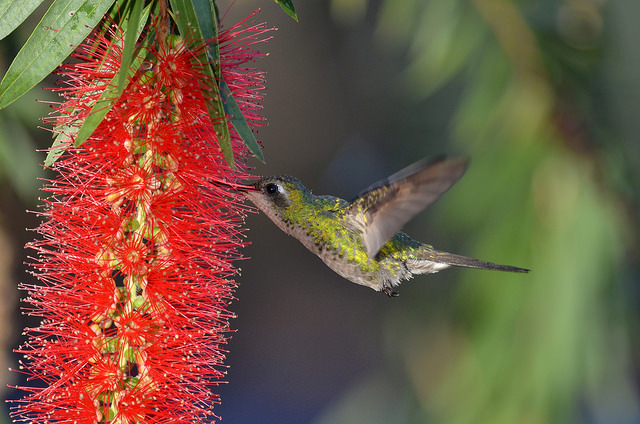 Like most hummingbirds they have a long thin bill and tongue, which they use to reach nectar deep within flowers (Gustafson, Mary). 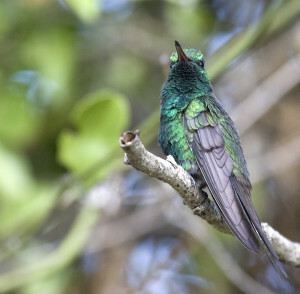 Cuban Emeralds are apodiforms meaning “footless” in Latin, and have short legs and tiny feet, which causes them to spend most time in the air (CUBAN BIRDS, NHPT). 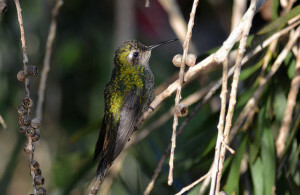 Both sexes have a white post ocular spot, behind the eye, and a forked tail; which differs in size between males and females, and pinkish under parts (Garrido and Kirkconnell). 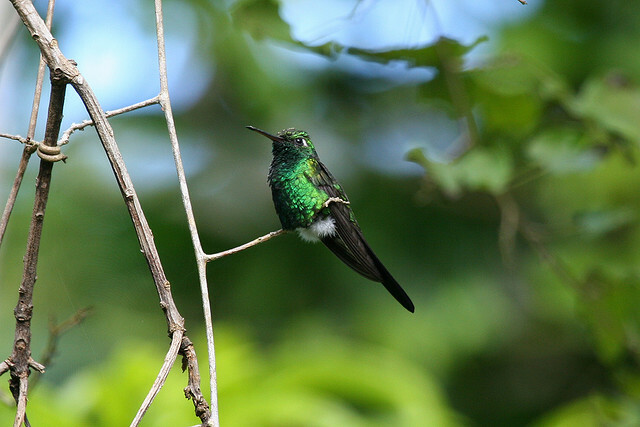 Female Cuban Emeralds have a less pronouncedly forked tail than males (SongbirdReMixWiki, RSS). Female emeralds are 3.7-4.1 inches (9.5-10.5 centimeters) long, slightly smaller than males, and weigh around 5 grams, slightly heavier than males (Johnson, Sibylle). Female Emeralds also differ from males in coloration, with upper parts that are green and bronze and under parts that are grayish becoming a dusky violet down to their semi forked tail. Females, like the male have rich greens on their back and sides (Bond, James). 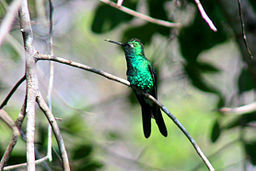 Male Cuban Emeralds are more colorful and have an evident slimmer body form compared to the female (PSB, Wildlife Guide). Male size ranges between 4.5-5 inches (10.5-11.5 centimeters), and weigh around 3.4 grams (Johnson, Sibylle). C. ricordii have a short black bill, consisting of a black upper mandible, and the lower red mandible with a black tip (SongbirdReMix, RSS). Upper plumage of male emeralds are, dark shiny green fading down the body into a metallic blue at lower parts, with a deeply forked tail (Johnson, Sibylle). Cuban Emeralds are a commonly widespread resident of Cuba, but also in the Bahamas (Garrido and Kirkconnell). They are bundantly found throughout the additional islands of Andros, Abaco, as well as the Grand Bahamas (Graves and Olson). In addition Emerald ecology has also been observed in Cayo Largo, San Andres, and the Isle of Pines (renamed the Isle of Youth)(Bond, James; Expedition). Other common places to find Cuban Emeralds would be Turks, Caicos Islands, western parts of Province of Pinar del Rio, extreme western tip of Peninsula de Guanaharcbibes, Cayo Coco, and southern Las Villas Province, Havana (Vaurie, Charles). Geographically, C. ricordii are attracted to any place that is well vegetated such as gardens or forests common of these islands (Gustafson, Mary). In addition these birds are known to be found from sea level up to at least 1300 meters above sea level; habitats from coastal to mid elevations, and absent elsewhere on the islands (Bundgen and Kirwan) (Garrido and Kirkconnell). Cuban Emeralds are essential to the pollination process of many plant life cycles in Cuba (PBS Wildlife Guide). The Emerald hummingbird has been able to avoid food conflicts with the “Bee hummingbird.” Due to its larger size the Emerald feeds on larger flowers and blossoms (PBS Wildlife Guide). Their diets mainly consist of vibrantly colored, tubular flowers high in sugar contents and high-energy nectar. Common plants fed off of include genus Ernadea family, which are erect funnel shaped flowers such as E. littoralis and E. pungenscred (Negron-Ortiz and Hickey). Year round nectar-providing plants include yellow hibiscus, Bougainvillea, as well as flamboyant trees (Keehnen Floris WM). Throughout winter months Emeralds rely greatly on Agave Braceana for nectar (Emlen T. John). Protein sources such as insects and spiders are necessary, especially during breeding (Johnson, Sibylle). About 61.1% of pray captures occur deep within the forest canopies of Cuba, snatched in fight of off branches or webs (Sealy G. Spencer). Cuban Emeralds are known to breed year round (Bundgen and Kirwan). Males court females through song and by flying in U-shape patterns. Immediately after copulation the female and male separate. It is common for this species to mate with several other partners (Johnson, Sibylle). Female C. ricordii are responsible for building a deep small cup shaped nest to lay two white eggs (Kirwan, Guy M.). Nests are made from green soft moss and other plant fibers held together with spider webbing (Johnson Sibylle). Nests are often well hidden in bushes 2-3 meters above ground (Johnson, Sibylle). Males contribute slightly by defending breeding territories while the female incubates the eggs. Young are born blind and immobile, relying on mothers regurgitated partially digested insects, pushed directly into the chick’s stomach with long beaks. Mother Emerald abandons the nest around the second week and chicks leave soon after that ( Kirwin Guy. M). Voice or song has a major part in males attracting females (Bundgen and Kirwan). Sounds have been described as high pitched, rapid “slee” notes, vigorous chit calls, and repetitive squeaking (Garrido and Kirkconnell). C. ricordii are of least concern of being endangered, they have not been recored in exact numeric form for such reason (BirdLife International). This species as well as other hummingbirds are referred to as “common”, and have a high degree of endemism due to rapid evolution (Lack, David). Hypotheses to understand Cuban Emerald saturation takes these four concepts into consideration; island communities being packed tightly together, species being habitat specialist, specific competition, and reducing competition through broadening the habitat spectra (Terbargh and Faaborg). Bündgen, R., G.M. Kirwan. Cuban Emerald (Chlorostilbon Ricordii). 2015 HBW Alive, 2014. Web. 29 Sept. 2015. CUBAN BIRDS. 2015 New Hampshire Public Television Durham, NH, 2015. Web. 29 Sept. 2015. Cuban Emerald Chlorostilbon ricordii. BirdLife International, 2015. Web. 30 Sept. 2015. Cuban Emerald (Chlorostilbon Ricordii). Internet Bird Collection, 2015. Web. 30 Sept.
Johnson, Sibylle. Beauty Of Birds. Avianweb LLC, 2011. Web. 29 Sept. 2015. PBS Wildlife Guide. PBS, 30 Mar. 2008. Web. 29 Sept. 2015. SongbirdReMixWiki RSS. MediaWiki, 26 June 2013. Web. 29 Sept. 2015. Bond, James. “Results of the Catherwood Chaplin West Indies Expedition, 1948. Part two Birds of Cayo Largo (Cuba), San Andres and Providencia.” Proceedings of the Academy of Natural Sciences of Philidelphia (1950) Vol. 10z. 43-63. Google Scholar. Web. Emlen T. John. “Territorial Agression I Wintering Warblers at Bahama Agave a Blossoms.” The Wilson Bulletin (1973): Vol. 85. No. Google Scholar. Web. Graves, Gary R., Storres L. Olson. “Chlorostilbon bracei Lawrence, and Extinct Species of Hummingbird from New Provindence Island, Bahamas.” The Auk (1987). Vol. 104, No. 2. 296-302. Google Scholar. Web. Gustafson, Mary. 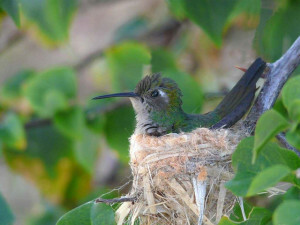 “Hummingbirds of North America”. The William Bulletin. (2001). Google Scholar. Web. Keehnen, Floris WM. “Conflicting Cosmologies.” Communities in Contact: Essays in Archaeology, Ethnohistory & Ethnography of the Amerindian Circum-Caribbean (2011): 253. Google Scholar. Web. Lack, David. “The Numbers of the Species of Hummingbirds in the West Indies” Evolution. (1972). Vol. 27, No. 2. pp 326-337. Google Scholar. Web. Negron-Ortiz, Vivian, and R. James, Hickey. “The Genus Ernodea in the Caribbean Basin II. Morphological Analyses and Systematics”. Systematic Botany. (1996). 445-458. Google Scholar. Web. Sealy G. Spencer. “Defense of Nectar Resources by Migrating Cape May Warblers.” Journal of field Ornithology (1989). VOl. 60, No. 1 89-93. Google Scholar. Web. Terbargh, John W. and John Faaborg. “Saturation of Bird Communities in the West Indies.” The American Naturalist (1980) Vol. 116, No.2 178-195. Google Scholar. Web. Vaurie, Charles. “Field notes on some Cuban Birds.” The WIslon Bulletin (1957): Vol. 69, No. 4. 301-313. Google Scholar.Web. Wikimedia Commons. Wikimedia Project, February 19, 2010- August 26, 2015. Web. 28, September 28, 2015.